It’s not all good, I’ll grant you. Pitched up at the foot of the Dales in a three-day downpour surrounded by grazing Fresians, puddles and damp ditches can be depressing. But the combination of lake, wetsuit, boats, fishing rods and campsite amounts to fun in any weather. Canoeing, sailing, surfing, swimming and snorkelling don’t rely on sunshine – they rely on access to a beach or riverbank. And that’s what the campsites in this book have. They get you out there. Until now, most have been kept secret and treasured by the people ‘in the know’. And for good reason. No one wants to discover a waterside gem only to see it become over-run with hundreds of tents, campervans, windbreaks, people and 24-hour noise. So, I spent five years looking. Looking for those secret hideaways. I did it by trawling around coasts, rivers and lakes. Looking at OS Maps and staying up into the early hours on Google Earth, using a computer screen to fly over canals and lakes, looking for anything that resembled a tent or caravan. Once a dozen sites had been saved in my favourites, I’d head off for a long weekend of camping, sometimes driving all night to explore the area by day. Within four years I’d discovered a few thousand campsites and I finally realised that there were so many that I didn’t need to worry about keeping them secret any longer. From the Gold Coast of County Waterford to the dunes of North Devon, from the Norfolk Broads to the turquoise waters of the Outer Hebrides and the Pembrokeshire path – Britain and Ireland are teeming with great spots to camp by water. And the best news of all is that the list just keeps growing and getting better. Every time I get the map out, more campsites have appeared. Water pollution has decreased dramatically in the last decade. Rivers and canals once ruined by the legacy of the industrial revolution have become the cleanest waterways in Europe. Beaches that suffered from sewage outflows have returned to safe bathing levels, largely thanks to superb campaigns by the likes of Surfers Against Sewage. For the first time in more than 150 years, it’s relatively safe to go swimming in Britain. Modern camping is not just about getting back to nature either – there’s a whole lot of new ‘stuff’ to embrace, too. Aside from wi-fi and sat-nav-enabled phones, improvements in fabric technology are the most important developments for the 21st-century camper. This is the dawn of an outdoor revolution. Gortex, eVent and battery-heated wetsuits make it easy to take on the coldest waters all-year round – even in sub-zero temperatures. Not that it gets too icy here. For every cloud hanging over these isles, there’s the silver lining of waterways, lakes, coast, canvas and caravans. Oh, and we get some sunshine sometimes! 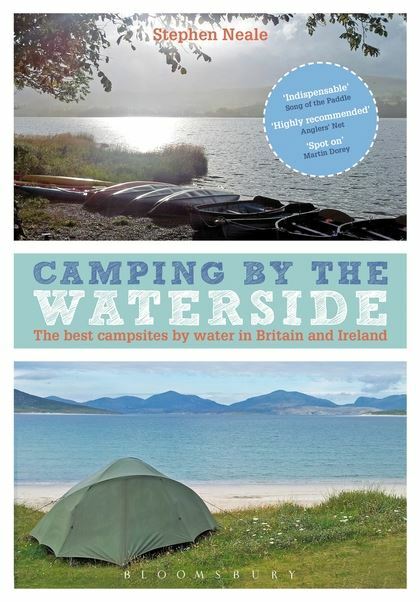 This book is based on the web directory Campsites on Water, which I've maintained for free since 2009. The site generated more than 100,000 views a month, but was hacked in 2015. It was closed down by the web host under terms and conditions, with all data and maps lost; so I moved host. A working archive of the site is here, but will likely vanish some time in the future. A new directory is being rebuilt.